This past weekend, I discovered another one of my favorite movies so far this summer ... The Spectacular Now, filmed in the charming locations of Athens, Georgia. Based on Tim Tharp’s novel and directed by Athens native James Ponsoldt, The Spectacular Now features two young, talented stars Miles Teller and Shailene Woodley. Fans of John Hughes will find the movie endearing. 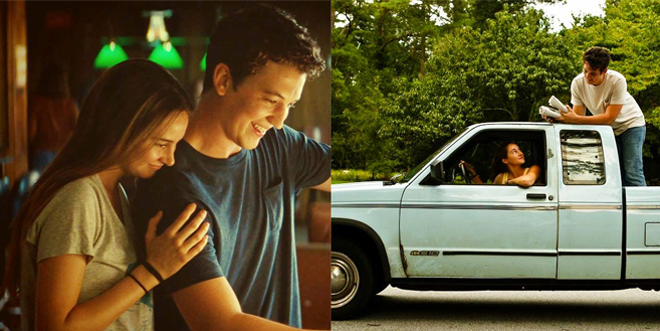 For me, The Spectacular Now finds its way into my heart the way The Perks of Being a Wallflower and Say Anything did. From the writers of (500) Days of Summer, The Spectacular Now stands apart from today’s typical teen movies of vampires and glossy characters. The movie has so much heart and the two young actors are so real. I feel their joy and heartaches because I’ve been there. We’ve all been there in one way or another. — James Ponsoldt, director of The Spectacular Now. PHOTO CREDITS: Above two photos are from the movie’s official Facebook page. Even though the setting of the movie is in Oklahoma, filming The Spectacular Now in Athens didn’t affect the story. Ponsoldt took care to choose locations in the suburbs and subdivisions of Athens and not at any well-known Athens landmarks. Ponsoldt also shared that Athens and its residents were welcoming and supportive. The production crew included a few people from Los Angeles, but the majority were from Atlanta, including an amazing group of P.A.‘s and interns from the University of Georgia. For more information on filming in Georgia, visit the Georgia Film, Video & Music Office (a Reel-Scout client).